The universal 24″ (W) X 36″ (L) vibrating screen is a versatile production screen that is a short stroke, high frequency screen, which is ideal for sizing particle sizes below 1/4″. It works well with small quantities of larger size particles as well. It is available in one deck, two deck models, with open style or enclosed style options. Materials of construction are high carbon steel and stainless steel. A 1/4 HP/1725 RPM/115 V/1 Ph/60 Hz TEFC motor is standard. 220 V/1 Ph/50 Hz is available. The screen deck is shipped completely assembled and ready to operate. The Vibrating Screen may be suspended by cables furnished by the customer. 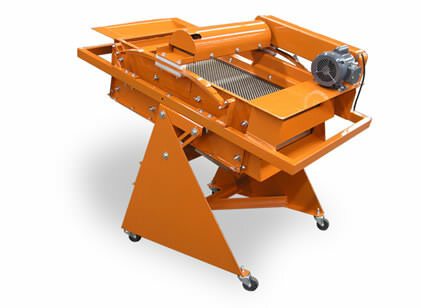 The Vibrating Screen is normally used mounted on the optional mobile stand, pictured below. This allows for easy adjustments in inclination. Screen Panels are available in stainless steel for the Vibrating Screen in sizes ranging from 1″ openings down to 200 mesh. Under ideal conditions, this deck has a capacity at 10 mesh, of 2,000 pounds per hour. It is well suited for screening from a few hundred pounds per hour up to a ton per hour. Typical screens used with 24” x 36” screen deck, specifications below.